With the last few days of summer to savor, I’m sharing a reliable and delicious side salad recipe that I have made quite a bit this summer, as my whole family loves it. 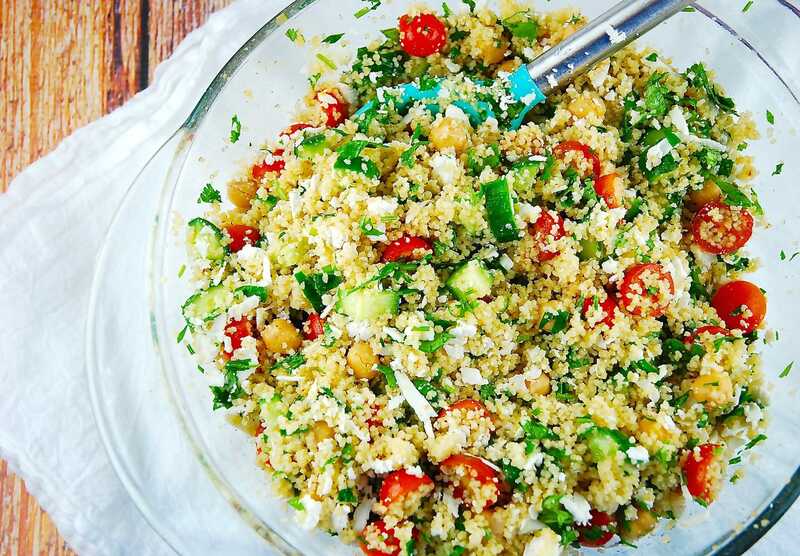 My Whole Wheat Cous Cous Feta Salad Recipe is super easy to make and is a delicious and satisfying side dish that works with so many different meals. The bright, juicy tomatoes, crunchy cucumbers and salty feta are combined with hearty garbanzo beans and whole wheat cous cous to deliver a seriously satisfying dish! It also works wonderfully as leftovers, so I often double the batch and use it in lunches the next day or two. So take advantage of those delicious summer tomatoes and get this salad on your table, ASAP! At just 4 Points per serving, it’s a great way to feel satisfied while staying on track. A quick and easy side salad that is simple, yet delicious and filling. Fresh flavors combined with hearty whole wheat cous cous makes this tasty dish a popular salad recipe that you’ll want to make again and again. Prepare cous cous according to package directions. Just had this for dinner, added chicken, very good.